Do you ever wonder what blog topics to write about? If you’ve just started your blog or you’ve been blogging for years, this video is pure gold for you! It will show you exactly how to flesh out a general topic and find specific topics to write about. You’ll learn how to find popular topics to blog about without having an email list or large social media following. This 17 minute video shows you step by step how to find popular topics. At the end of this video you’ll be able to map out your entire blog (or even a book) and have a topic to write about each week – All in under an hour! Let me know in the comments below what your blog is about! Are you trying to find topics for your blog? Or maybe for a future book? Blogging can be a fantastic way to build up an audience before you launch a new product! Let me know what you’re writing about below. Click on any step or scroll down to read the details. Pick a plan or a niche and start creating your thought process from there. Deciding to start a blog is wonderful, but if you don’t’ narrow it down just a little bit, you’ll find yourself constantly spinning your wheels trying to gain traction. There are plenty of things to write about, you just have to know what direction and path you want to take your blog down. The choice is ultimately up to you, you can start broad and niche down over time. There are literally never-ending topics to write about. Even when you feel you’ve exhausted every possible topic for gardening (just an example), I can assure you that there are plenty of other blogging topics just waiting to be explored. Most times when you’re feeling that you’re running low on blogging topics and ideas is because you’re starting to get a bit burnt out or defeated. Don’t give up. The blogging world is full of highs and lows but if you can follow along with this simple plan I’m about to share with you, I can assure you that you’ll be on an amazing path for producing great content. Before we dive in on these simple tips, you have the ability to have your own successful blog. Success doesn’t happen overnight but success does happen. I’m proof, many of my students are proof and thousands of other bloggers out there will tell you the same thing: If you’re willing to do the work, you’ll reap the rewards. I’ve created a simple method that can help a new blogger on their first day to a seasoned blogger who has thousands of other posts. And guess what? 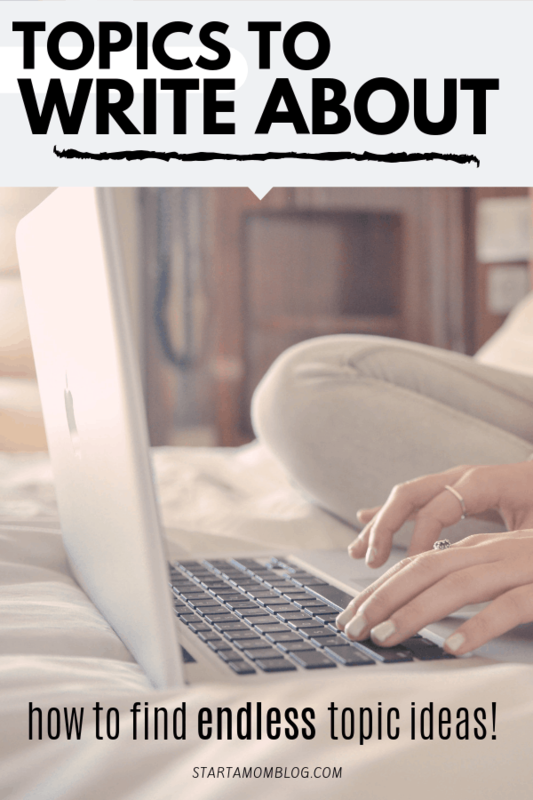 You’re getting this information to use to help you kick start your own blog as well! Once you learn and understand this method, you can plan out your entire blogging content calendar for the entire year in just about an hours worth of work. And yes, I’m 100% serious. Are you as excited as I am to get started? It’s important to have a general idea of what you’re going to be blogging about. Not as general as “life”, but something along the lines of business, homeschooling, gardening…you get the idea. And if you’re struggling on what to even categorize your blog into, just stop and think about what you like. Or what problems you can solve for your audience. Anytime you can write about something that you love as well, that honestly and rawness comes through to your readers and builds a real connection. List out all the ideas you have about your niche. Have fun with this. This is for your eyes only and is just a rough draft. Jot them down and let those ideas fly. And once you’ve exhausted the resources in your head. it’s time to head to Pinterest. Yep, you read that right. You can get a ton of great blog topic ideas by heading over to Pinterest. All you need to do is type your niche in the search bar at the top of Pinterest and you’ve just unlocked an unlimited potential of blog topics. 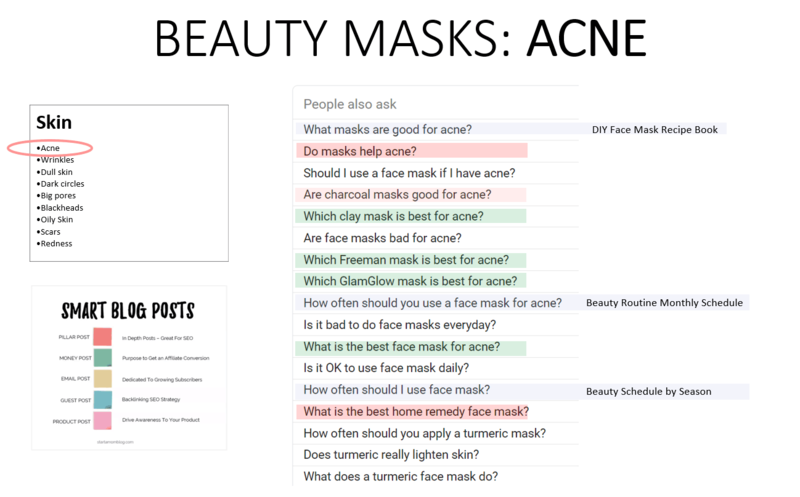 I use the example of beauty masks in the video, but in the image you can see the search results for Whole30. Look at all those topic ideas! See those little bubbles that pop up underneath the search bar full of words? Those words are gifts from Pinterest letting you know what people are searching for. What you do with this information is how you will set up topics for your blog. Go through the words and find ones that fit your niche. Once you have the words picked out, it’s time to take those words and add them to a spreadsheet for future use. But…now what? Now that you have your ideas, your words, and your categories, what do you do with all that information moving forward? Two words. Google it. If you’re wanting to know how to take your topics and turn them into blog posts, Google has already done the work for you. Go on…try it out. Open up a browser and type in your main word about your blog. Whether it be “homeschooling” or “camping”, you’ll notice a small section on Google called “People also asked”. Those questions are where you get great insight and information about what to write blog posts about! Each one of these questions can be used to write a separate blog post with ease. Simply turn the question into a statement and you’ve got your next blog title as well. See how simple this can be? And trust me, Google loves online outlets that answer questions. Plus, you can use those questions to offer great opt-ins, branch off of and really build your online audience. Once you let Google do all the work for you, all that’s left is to implement what you’ve gathered. If you happen to come across a question that you don’t know the answer for, ask advice or information from an expert in the field or do your own research to get facts. The amount of effort that you put into your writing and research will pay off in the end. The more content and blog posts that you write, the more traffic you’ll generate. Starting out, it’s important to write at least one blog post per week. This shows your audience your committed and shows Google that you’re blog is alive. Knowing that you need 52 posts at a minimum for the year may sound like a lot, but with the steps above outlined and detailed and just waiting for you to implement, this won’t be hard for you to accomplish at all. 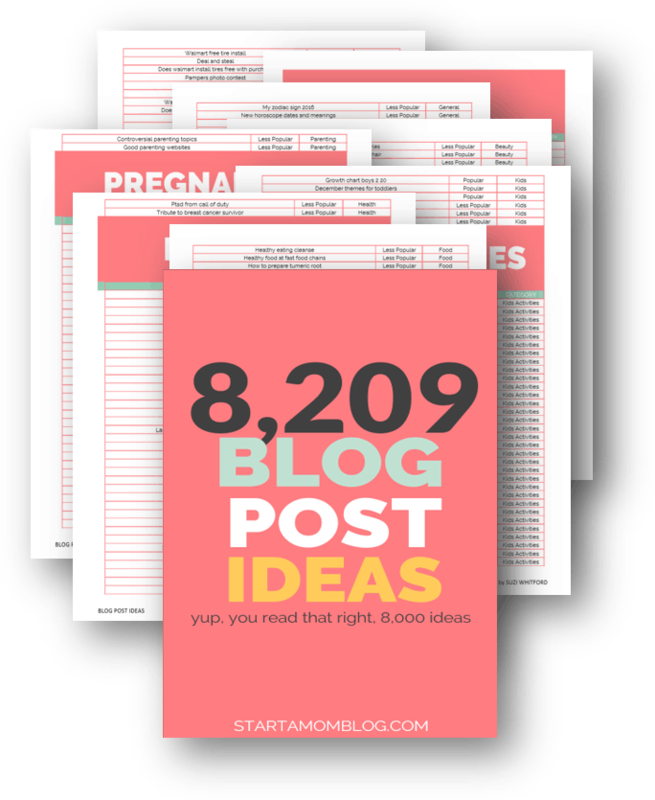 If you’ve followed along this post, you now have an idea of the main topics for your blog. This can also be translated into your blog menu items. And you also have a years worth to topics to write about by following step 4. How do you organize all of these amazing ideas? 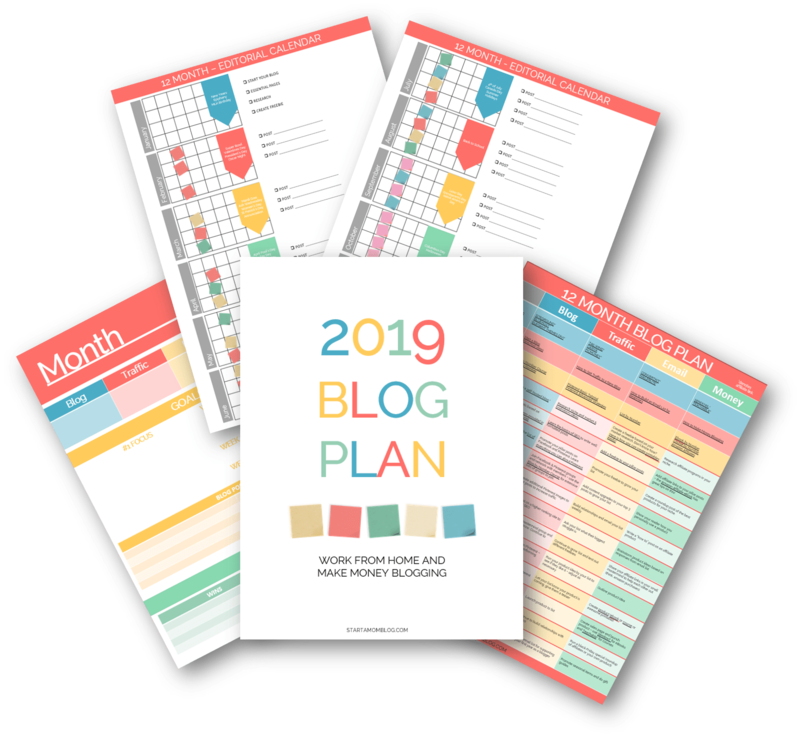 I have a Blog Plan and editorial calendar template for you for free! You can download it here to keep yourself accountable. Let me know in the comments below, did you like this method of finding endless topics to write about? This is fantastic! I just created my editorial calendar for the entirety of 2019. Whoohooo! That feels like a major accomplishment. Thank you for your guidance and inspiration, Suzi! It IS a major accomplishment!! Good job Alice!! Suzi, You are over the rainbow amazing with your training. Even though I am not a stay at home mom. I am a work from home grandma. Thank you so very much for all you are doing to help women. I am more excited about this than I thought would be possible. Thank you so much Dana!! I love your energy <3 I can feel it! This is very helpful to newbies like me. Thank you so much for sharing. 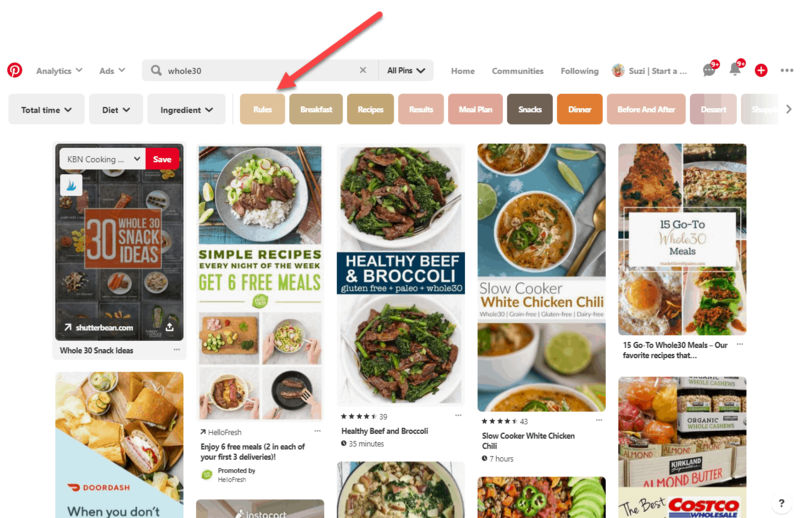 When I try to follow the first step and do the search in Pinterest, I don’t get the colored blocks up top. Am I doing something wrong? Thanks. Thanks for the article. I am a single mom and write about personal finance for single parents. Your information will help me make sure my content is relevant and beneficial. I just discovered your site last night and for all the years i’ve Been browsing diverse topics (and how-to-blog posts) for years I have NEVER found one that gave so much excellent and free advise. I purchased both the e-book and your full Blogging-Step-by-Step partly because you give out so much helpful yet free information. You aren’t grubbing for every dime and I appreciate that. 99.9 of ads for how-to books/courses/etc are all hype and no helpful ideas one can use without purchasing something. I feel hesitant to pay money with no idea of the scope and content. You build up trust and confidence in your content and your honesty. Hi Suzi! Yes, this video was very helpful and encouraging. I now feel confident I can make wanted content forever. I am excited to continue working to create my blog! Thank you so much. This is so inspirational and motivating. Your advice and guidance are excellent. Keep up the great work. I love all the work you’ve done so far. Looking forward to see more. It’s so encouraging for me to kick start my blogging journey. Suzi you are a true gem! I found more value in this post and video than I have in most paid courses! Thank you for sharing your vast knowledge with us just starting a blogging journey! I am blogging about homesteading and gardening as broad topics. This was wonderful! Thank you!!! This is wonderful! Thanks Suzi! The one thing I’m just struggling with is Home decor/interior design is such a broad topic that I don’t know where to go from there. I just love your content! It is so helpful! I am a blogger as part of a group on a Christian Women’s blog but just starting my own blog http://www.periwinlehill.com. About crafting, home décor, DIY, and Interior Design on a budget. There is a lot of things on the backend (admin stuff) that I did not know so I have been doing a lot of research. You have a gift for teaching and you make your tutorials easy to understand. Keep up the good work!